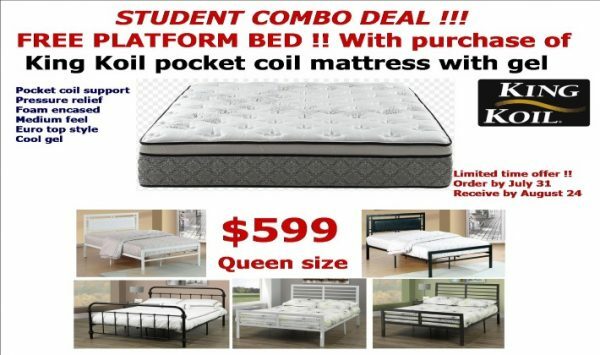 Outstanding value for our students or anyone needing a great quality mattress and frame , but on a budget ! We have put this incredible offer together for a limited time! Get your choice of select platform beds ( for Free) , when you purchase this King Koil pocket coil Euro Top mattress for only $599.00 Queen size . Features a top quality pocket coil design for great support and pressure relief . less motion transfer between you and your partner! Medium feel , Euro top design for side , back , or stomach sleepers! Cool Gel lumbar support ! All of these features for only $599.00 Queen size !! Plus your choice of 3 different platform beds!